June 23, 2017, Rockville Centre, N.Y. – People with disabilities and their families often struggle to gain access to safe, affordable housing and related services such as job training. The Disability Opportunities Fund (DOF) provides technical and financial services to individuals and organizations serving the disability market throughout the United States. The DOF is one of the many Community Investments the Adrian Dominican Sisters make as part of its commitment to social justice. This spring, a nonprofit farm vocational program just outside of Rochester, New York, is cultivating the seeds of inclusion thanks to the DOF. Jenny Brongo is the sibling of a person on the autism spectrum. Because her brother responded well to being on their uncle’s farm, Jenny developed a vocational program for him and others to promote skills training, socialization, self-awareness, and career exploration for people of all abilities. 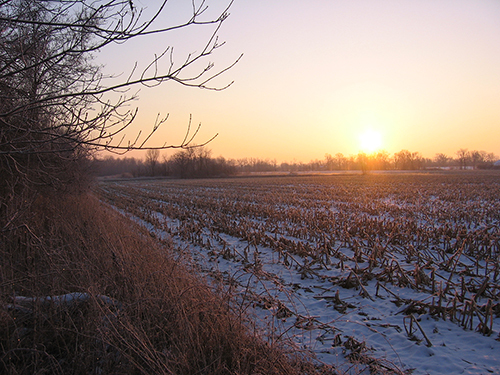 This program, called Homesteads for Hope, has operated two seasonal farm vocational pilot programs and hosted community outreach events since 2014. In August 2016, with support from a $1.2 million loan from the DOF, Homesteads for Hope purchased a 55-acre historic farm in Ogden, New York. 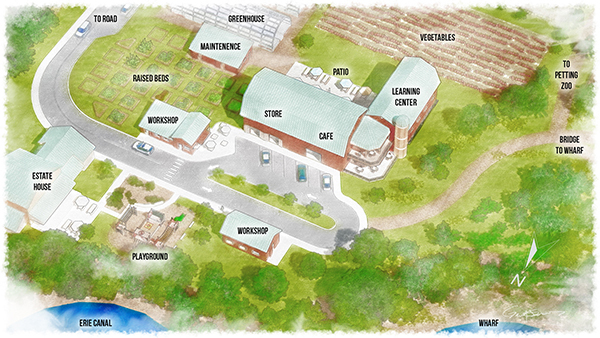 The organic farm and its collaborative partnerships with the local community offer a unique vision that will provide jobs, organic food, educational programs, and community and living spaces for people of all abilities. 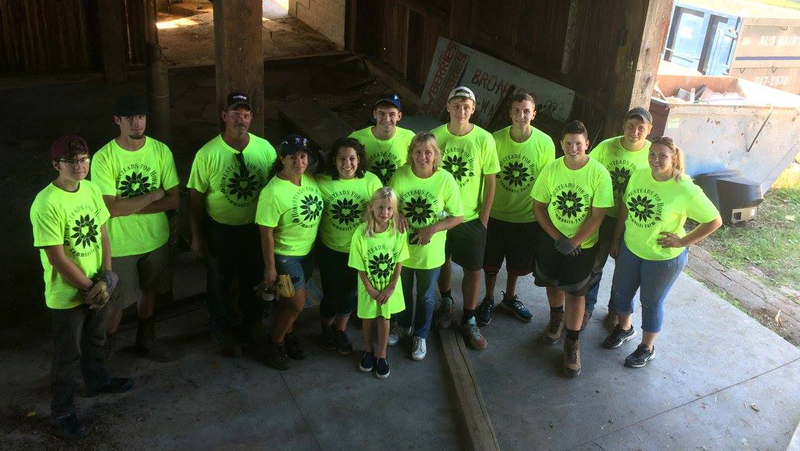 Community members gather to help restore the farm for Homesteads for Hope. Feature photo at top: Charles Brongo at the new Homesteads for Hope farm. April 7, 2017, Adrian, Michigan – Shareholders in public corporations have a unique privilege, opportunity, and responsibility: to use their proxy ballots to shape the values and decisions of those corporations. That was the message of Adrian Dominican Sister Corinne Florek, OP, Executive Director of the Religious Communities Investment Fund, in a live-streamed April 3 talk, “How One Checkmark Can Influence Corporate Policy.” Her address was given in the auditorium of Weber Retreat and Conference Center on the Motherhouse campus of the Adrian Dominican Sisters. She noted the strong economic influence that corporations carry: of the 150 largest economic entities, she said, 87 are corporations. Some 91 million U.S. adults own some stock, she noted, adding that most throw away or recycle their proxy votes rather than voicing their values. Sister Corinne encouraged individual shareholders to consider the values they support and the industries they would like to avoid supporting, and to ask their financial advisers to craft a portfolio that reflects these choices. Then, as individual investors, they have the right to guide the corporation’s decisions through their proxy vote. “Proxy is just another name for a ballot that contains resolutions that are up for a vote,” Sister Corrine explained, adding that proxies also include a slate of candidates running to serve on the corporation’s Board of Directors. Resolutions can deal with issues such as environmental impacts and disclosure of the corporation’s lobbying expenses and treatment of workers. If shareholder resolutions receive support of 3 percent of the proxy voters, the corporation will remain in dialogue about those issues. “The proxy voting is the incentive for the corporation to stay in the dialogue,” Sister Corinne explained. When shareholders don’t vote at all, their votes are considered to be in favor of the view of the corporation’s management rather than of shareholders who are trying to make changes, she added. Using proxy voting to help bring more justice into the economy is not a new practice. Sister Corinne noted that the Adrian Dominican Sisters have been involved in economic justice through corporate responsibility for more than 40 years through the Congregation’s Portfolio Advisory Board (PAB). The Congregation is also working with hundreds of other faith-based organizations, members of the Interfaith Center on Corporate Responsibility (ICCR), to ensure that the corporate world reflects values of justice, care for the environment, and concern for workers and low-income people. 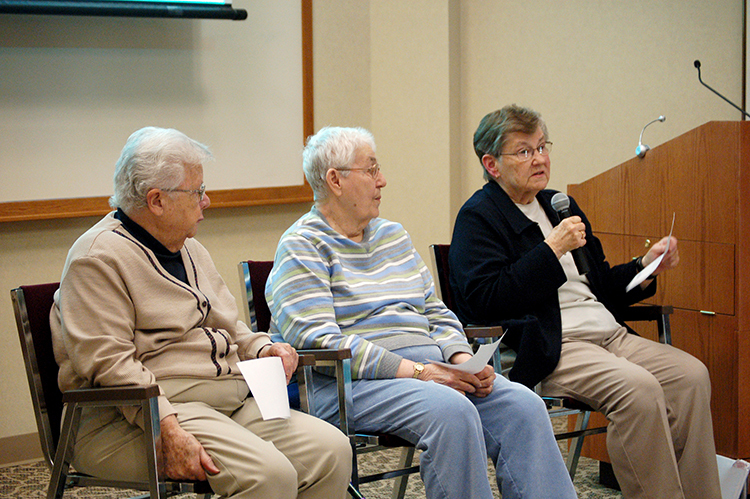 Panelists included Sisters Thérèse Haggerty, OP; Joan Marconi, OP; and Frances Lombaer, OP. Sister Corinne concluded her talk by giving investors some ideas on how they can both diversify their portfolio and make a difference in the world. 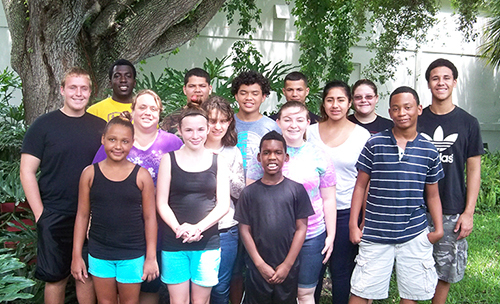 Invest in high impact community development organizations that work with low-income people and communities. “This isn’t high-risk investing,” Sister Corinne said. “This is investing for high impact, which means that it’s in low-wealth, low-income, low-asset communities, to help them, to empower them” to find security, livelihoods, jobs, housing and access to credit. She added that, over 40 years of investing, the Congregation has only lost less than 1 percent of its investment. Invest in credit unions. Sister Corinne suggested taking at least some funds or assets – such as CDs or your savings account – and placing them in credit unions. “Nobody’s making a profit off these financial institutions,” she explained. 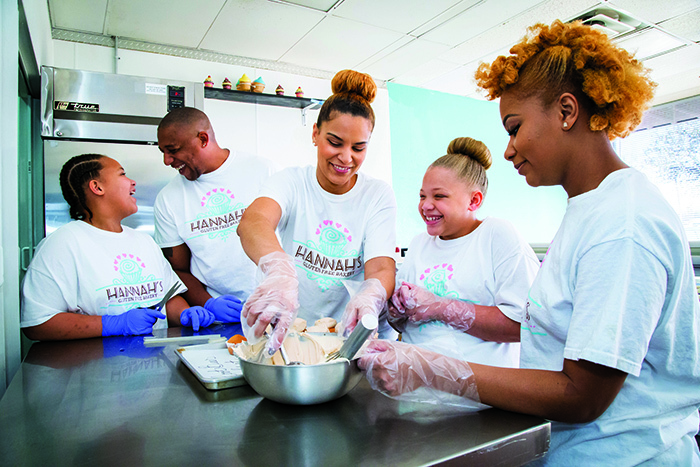 “All the profits go back to making loans to the members.” Credit unions serve populations such as low-income borrowers, people of color, women, distressed areas, and rural areas – areas that big banks don’t always serve, she said. “Please join us in this effort to create more justice in our economy,” Sister Corinne concluded. To watch her presentation, click here. February 13, 2017, Adrian, Michigan – Many people equate Haiti with poverty – with its reputation as the most impoverished nation in the Western Hemisphere. But Leigh Carter, who has worked with Haitians for nearly 20 years, sees signs of hope in the women who have climbed out of poverty and now provide a decent life for their families. Leigh, founder and Board Member Emeritus of Fonkoze USA – the U.S. non-profit organization that raises funds and awareness for Fonkoze – gave a special presentation on the work of Fonkoze February 6 in Weber Auditorium at the Adrian Dominican Sisters Motherhouse. Her presentation, “The Adrian Dominican Sisters and Two Decades of Partnering with the Women of Haiti,” followed a meeting of the Adrian Dominican Sisters’ Portfolio Advisory Board (PAB). Founded by the Adrian Dominican Sisters more than 40 years ago, the PAB helps the Congregation to use its resources to bring about economic justice through socially responsible investing in corporations and communities. The Adrian Dominican Sisters were among the first to grant low-interest loans to Fonkoze, and have been partners with the organization since 1997. Leigh became director of Fonkoze USA at the invitation of Father Joseph Philippe, a Haitian priest who founded Fonkoze in 1994 to address poverty in Haiti. She attributed her connection to the Adrian Dominican Sisters to Sister Maureen Fenlon, OP, who encouraged Leigh to apply for a low-interest loan from the Congregation. Fonkoze USA received $200,000 in loans from other congregations of women religious after the Adrian Dominicans approved an initial loan. In 20 years, Leigh said, Fonkoze has become “Haiti’s largest microfinance organization,” offering loans and other banking services to individuals – mostly women – in their efforts to become self-sufficient. Fonkoze now has 45 branches throughout Haiti, with $65,000 outstanding in loans to Haitian market women, and more than 200,000 people who are saving their money through Fonkoze. Leigh spent much of her talk describing Fonkoze’s “staircase out of poverty” program. The first step, “Chemen Lavi Miyò,” focuses on the “ultra-poor,” women who “basically haven’t managed money ever or touched money – they’re basically begging at the marketplace.” The women receive $25 loans to help them get started in a business. 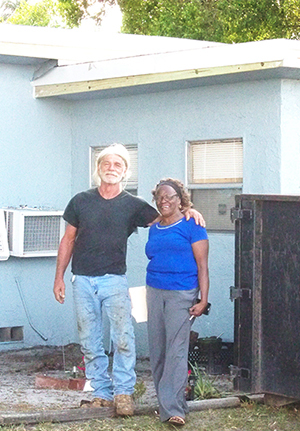 In addition, Leigh said, their homes are upgraded to include a cement floor, a tin roof, a latrine, and a water filter. They are also expected to send their children to school. After two years of group training, Leigh said, the women are “arguing over who’s going to speak at the graduation in front of 400 people” – a drastic change for women who, at the beginning of the program, “can’t look you in the eye” because they feel ashamed. Not all of the women who undergo the most basic training program move up the staircase, Leigh noted, but they have still found their lives to be “amazingly improved. Higher up the staircase, Leigh said, women are organized into groups of five or six, forming “credit centers.” Currently, she said, some 65,000 women are organized into 2,000 credit centers. 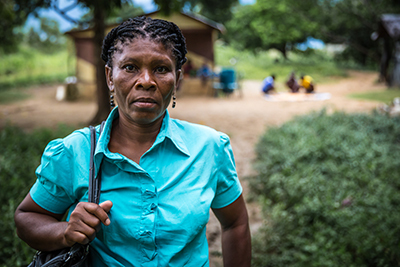 The women meet twice a month – once to meet with their credit agent or to repay their loan, and the second time to receive education on anything from cholera prevention to improving their businesses. Leigh pointed to success stories of women who began as “ultra-poor” and became successful market women. One such woman, now in the business development stage of the program, works in wholesale, which loans in the thousands of dollars. “Instead of her husband sending her money from Miami, she sends money to him,” she noted. Fonkoze thus focuses on “meeting women wherever they are in this journey out of poverty,” Leigh said. “Some people don’t make it,” often because of challenges such as hurricanes, earthquakes, and fires. Nine Fonkoze branches and about 14,000 clients were affected by the recent Hurricane Matthew. Fonkoze has been monitoring all of these clients to determine who has repaid their loans, who needs to restructure their loans, and whose loans need to be written off, she said. In the question and answer session, Leigh noted that Fonkoze has been able to make a difference in the lives of individual Haitians – but that Haiti, as a whole, could be in “worse shape” than when she arrived 25 years ago. Feature photo at top: Leigh Carter, of Fonkoze USA, gives a talk on how her organization has helped women in Haiti on their journey out of poverty. Photo by Jessica Havens. October 25, 2016, Adrian, Michigan – The Adrian Dominican Sisters’ Portfolio Advisory Board (PAB) is sending out a new loan to Fonkoze USA for its efforts in securing financial and technical support to its Haitian partner, Fonkoze. The loan was recommended by the PAB and approved by the Congregation’s General Council. The Adrian Dominican Sisters have been involved with Fonkoze since 1997, when it first received a loan from the Congregation. Sister Maureen Fenlon, OP, served on the founding board of Fonkoze. “As a Haitian institution, Fonkoze is adept at navigating the complexities of working in a failed state with limited infrastructure, insecurity, economic instability, and climactic crisis,” according to Leigh Carter, founder of Fonkoze USA. The organization is working to mitigate the damage brought about by Hurricane Matthew on October 4, 2016. The hurricane brought “near total devastation” to some areas, and coastal areas continue to suffer from flooding, Leigh Carter reported. Communications channels and the efforts of rescue teams were hampered by the effects of the hurricane. Before Matthew struck, staff members of the Fonkoze branches had taken precautions by securing files and equipment. The day after the hurricane struck, 27 branches were operating online to assist the people who desperately needed financial help in the wake of Matthew. Staff members of Chemen Lavi Miyò (CLM), a Fonkoze program that serves the ultra poor, immediately began to visit the households of their clients. CLM’s budget includes an emergency fund to support its clients in the current crisis. The nurses in Fonkoze’s Community Health Store reached out to the local community health entrepreneurs. In addition, they will hold a campaign between October 17 and October 31 to train the entrepreneurs on hygiene and cholera prevention, making antibacterial soaps and chlorine solution tablets more readily available. 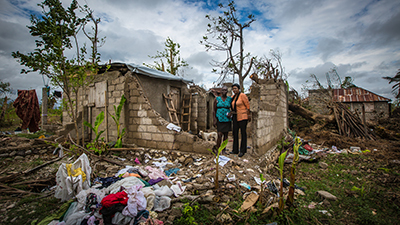 Fonkoze has learned from its experience in several disasters that have struck Haiti: Hurricane Jeanne in 2004; Hurricanes Faye, Gustav, Hanna, and Ike in 2008; and a 2010 earthquake that killed more than 200,000 people. In those situations, Fonkoze took the steps necessary to help their clients recover from disaster: forgiving the outstanding balance of loans, offering special loans to help in their recovery, and offering money transfer services to people who desperately needed the immediate financial help. October 4, 2016, Adrian, Michigan – Numerous aspects of the issue of climate change and its effects on Earth have been discussed and analyzed in recent years. A presentation, sponsored by the Adrian Dominican Sisters’ Portfolio Advisory Board (PAB), focused on a unique but vital slant: how finance can be used as a tool in the fight against climate change. Geeta Aiyer, CFA, founder and president of Boston Common Asset Management, spoke on “The Climate Finance Landscape – Mitigating the Impact of Climate Change” in the auditorium of Weber Center, before an audience of PAB members, Sisters, Associates, and Co-workers. Geeta has worked closely with the Congregation for about 20 years as an investment manager. During her talk, Geeta focused on how finance tools can be used as part of a strategy to persuade corporations such as energy companies to lessen the effects of climate change on our planet. Geeta gave a mixed review of the effectiveness of one popular tool: divestment, selling off your stocks and having nothing to do with a fossil-fuel company, for example. Divestment is a “values statement that says you don’t want to participate in it.” However, she added, the stocks could then go to other owners who don’t care what effects the fossil-fuel companies are having on the environment. In addition, other companies besides fossil fuel corporations put carbon into the air through their operations. Geeta pointed out that activist shareholders — those who want to make a difference to the environment or social justice through their investments — have a range of tools to persuade corporations to take the environment into account, from dialoguing with the companies to engaging in shareholder resolutions. The PAB, through its Corporate Responsibility arm, engages in those actions to bring about greater social justice and enhance the common good. Dialogues between activist shareholders and the companies in which they invest can take many forms, Geeta said. She emphasized the importance of working with fossil-fuel companies to begin to produce renewable energy, with other companies to reduce their use of carbon and to be more efficient, and with insurance companies and banks, who enable continual construction that can increase the use of fossil fuels. Geeta expressed her own optimism that fossil fuel companies and other corporations will eventually act to make the environment more sustainable. “When we know people are watching, we change how we do things,” she said. For example, if fossil fuel companies realize that the demand for carbon-based energy has been reduced, they might supply more energy through renewable sources. Companies in every sector could become aware of opportunities to make a difference through more efficient use of energy or through technology that helps consumers to measure their own use of energy. To hear more about this complex issue, watch the video of Geeta’s entire talk. September 2, 2016 - A well-known asset management specialist will be the featured speaker in a presentation hosted by the Portfolio Advisory Board. Geeta Aiyer, CFA, founder and President of Boston Common Asset Management, will talk about "The Climate Finance Landscape — Mitigating the Impact of Climate Change" at 1:15 pm. September 8 at the Weber Retreat and Conference Center. Aiyer uses her extensive experience in finance to fuel leadership and innovation in the areas of environmental sustainability and social justice. More details about Aiyer and the upcoming talk are available here.